“This is the best day of my life!” exclaimed Barton Elementary School student Damian while perusing the school’s third annual Science, Technology, Engineering and Math (STEM) Expo. Student ambassadors sporting white lab coats escorted visitors to several exhibitions, including displays and activities provided by Long Beach Gas and Oil, Crimson Pipeline, Long Beach Airport Club, Cub Scouts, Shared Science, and a geologist group from Cal State Long Beach. Barton regularly partners with local employers and community groups to support a schoolwide focus on STEM and the arts. The recent event also included a display of a solar-powered car from Cal State Los Angeles, with inquisitive students learning how the car drives without gasoline. Barton teachers organized booths offering various activities to their students. A popular booth was the marshmallow construction site where students created structures using marshmallows and toothpicks. Another exhibitor, Dramatic Results, provided students with materials and instructions on how to make catapults. After students made their catapults, they measured how far they could shoot a ball. Some students used trowels to plant succulents in the desert area of the school’s garden. First grade teacher Maria Bogdanovic chronicled the event for this article. “Families truly enjoyed the afternoon of learning and discovery together,” she said. 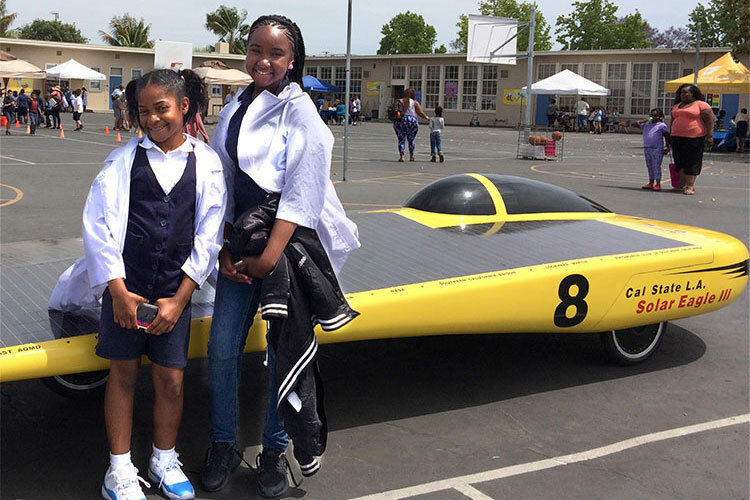 STEM EXPO – Barton Elementary School students Kalani Overall and Kamora Rivers pause at a display of a Cal State Los Angeles solar car, one of several exhibits and activities at the school’s recent Science, Technology, Engineering and Math (STEM) expo. The school partners with local groups to support STEM and arts education.